NASA's Opportunity rover returned the first pictures of its landing site early today, revealing a surreal, dark landscape unlike any ever seen before on Mars. Opportunity relayed the images and other data via NASA's Mars Odyssey orbiter. The data showed that the spacecraft is healthy, said Matt Wallace, mission manager at NASA's Jet Propulsion Laboratory. "Opportunity has touched down in a bizarre, alien landscape," said Dr. Steve Squyres of Cornell University, Ithaca, N.Y., principal investigator for the science instruments on Opportunity and its twin, Spirit. "I'm flabbergasted. I'm astonished. I'm blown away." The terrain is darker than at any previous Mars landing site and has the first accessible bedrock outcropping ever seen on Mars. The outcropping immediately became a candidate target for the rover to visit and examine up close. 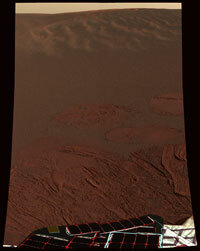 Wallace noted that the straight-ahead path looks clear for the rover to roll off its lander platform. The rover is facing north-northeast. JPL Administrator Dr. Charles Elachi said, "This team succeeded the old fashioned way. They were excellent, they were determined, and they worked very hard."